Website and search analysis suggests that Rapid Steel could increase revenue by providing more relevant information about its products and services. As you'll see, behavioral data suggests that people want to know more about products before buying, but there's little content to meet that need on the website today. All charts and data in this report exclude traffic from Rapid Steel on-site staff and the website's developer. Website traffic has been fairly stable and flat since the website launched. This may be the second year in a row that shows an uptick in website conversions in the spring quarter (submissions using the website inquiry form). 20% of all website clicks on desktop were on the order form shortcut bar. Presumably a significant percentage of this activity can be attributed to returning customers who know what they want. 14% of all clicks went to view products in the navigation. Once visitors click on products, they're taken to this products section. 10% of all website clicks during this mapping session represented people clicking on product names that don't link to more information. Since these aren't links, there is no additional information. Without further information, visitors must choose to either contact Rapid Steel or find more information elsewhere. 10% may seem small, but for reference, just 5% of all clicks went to the website contact form. From this, we can surmise that roughly twice as many people wanted to view product information than those who contact Rapid Steel. How many of those people might have gone on to use the inquiry form to place an order, if they had more product information? Each of these companies have pages dedicated to boiler tubing, which is why they're performing better in search and probably getting more business because of it. 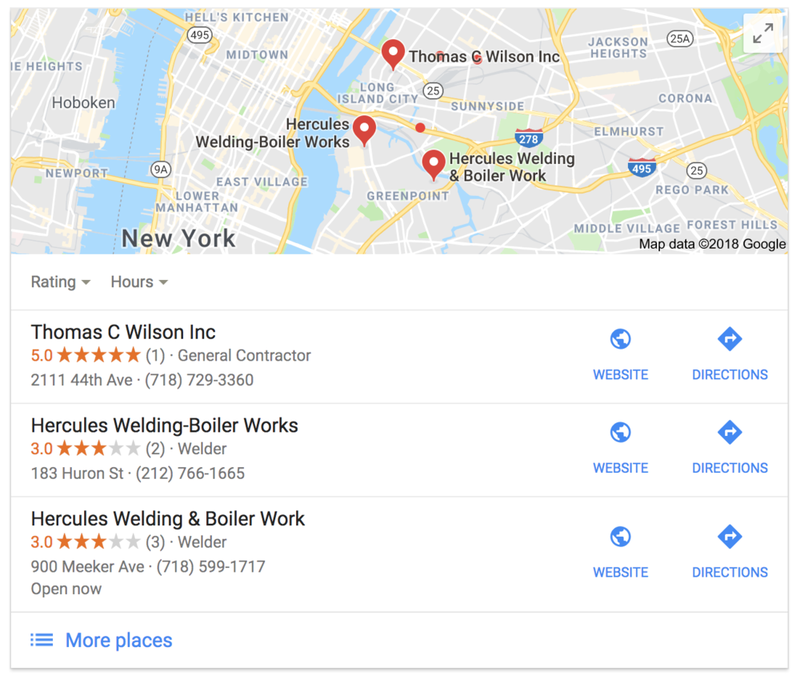 Rapid Steel isn't featured in local map results for "boiler tubing"
This chart compares trends for visitors and conversions (contact/order form submissions). Note that conversions are shown at 10x scale to more clearly visualize the trend line relationship. Acquire more visitors, as more traffic results in more orders. You should be able to address both of the above options by providing more information about your products. Are in greatest demand by customers. Start small — at the intersection of high margin and demand. Then, we can review customer's response by looking for an uptick in inquiries, more traffic to the site, and/or shifts in website usage as seen in the heat maps above. Is that something you'd like to pursue this summer? Let me know. Here's a demo of how we might use Airtable to let your team process and collaborate on orders, while allowing customers the option of including attachments in their submissions. You can view the Airtable base here. I'll be in touch — and you can reach me by email or by phone at 316.204.9810. This data excludes traffic from Rapid Steel on-site staff and the website's developer. There was a spike in form submissions in the spring. Is that a regular seasonal pattern for the business? Were there any promotional efforts going on during that time that may have had a positive effect on sales? 5,452 unique visitors have viewed the contact form since the website was launched in late 2015. There have been 10,534 total views (including returning visitors) of the form during that time. 94% of the people viewing the contact form were on desktops or laptops. This is an unusually high number. It's more common to find 30%–50% of form views coming from mobile devices. The percentage of people who complete the form is 7%, and the average time it takes to complete it is just under 9 minutes. Visitors who submit the form on a mobile device do so in about half the time it takes for someone on a PC. We could include an option for customers to sign-up for a Rapid Steel newsletter in the online inquiry form. This would let us create follow-up surveys for customers, which could provide insights as to how Rapid Steel can provide better service. These follow up surveys can also allow us to gather testimonials to publish on the website, which is often a good way to boost sales. We could even create incentives for first-time customers to complete the surveys by offering a discount off their next order to encourage an ongoing business relationship with new customers. A significant portion of sales inquiries are coming from college students and faculty. Rapid Steel could capture a larger percentage of that audience by offering a small discount on orders to anyone with a current student/faculty ID through its website, newsletter and social media channels. Customers sometimes ask whether Rapid Steel carries a particular product. For every inquiry submitted, there may be others who simply order from a competitor whose website makes it clear that they already have the product in stock. By publishing an online inventory, we can help customers get straight into the ordering process, and take out the guess work for them. Even if we begin by publishing an inventory of just the most popular products, we can then put a prominent search box in place. We can review what customers type into that search box and grow the inventory based on customers' needs. Having an online inventory will also boost the website's rankings for keyword searches and should increase overall traffic to the website. I hope this was helpful. If you have any questions, or would like to get started developing any of the projects suggested here, send me an email.